Mysuru: According to the 2011 Census, more than 2.35 lakh people in Karnataka suffer from profound hearing impairment. Cricket legend Brett Lee, who is the Brand Ambassador for Cochlear, a Australian base company, was in city on Friday to raise awareness about Universal New-born Hearing Screening (UNHS). ENT Surgeon Dr. H.A. Dathathri also joined him to talk about hearing issues and the need for early screening and intervention for children with profound hearing loss. “Parents and family members should not ignore the smallest signs of hearing loss and should take speedy action. I have personally witnessed how an implant takes a person from silence to sound. It is a life changing moment,” he said. How do you feel when you see hearing impaired children? Can these children participate in sports? Can cricket be played in silence? Why have you involved yourself in creating awareness about this problem?” These were the searching questions posed by the students of All India Institute of Speech and Hearing (AIISH) to Brett Lee at an interaction held at the Knowledge Park auditorium at its premises here yesterday. 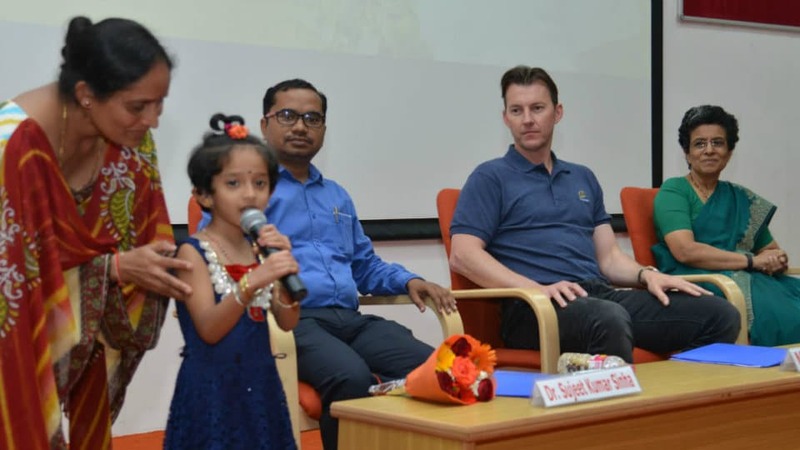 Speaking on the occasion, Brett Lee said that just as lot of importance is given to Polio in this country, the same importance must be given to infants with hearing impairment. If the problem is diagnosed at a young age then it can be addressed easily. Lauding the efforts of Kerala, a first in the country to screen children for hearing loss in 66 government maternity centres, he wonder such tests were not being conducted in Mysuru and Mumbai. Lee’s son was five when he had a fall and fractured part of his skull. The injury was close to his ear and led to hearing loss in one of the ears which was later restored. This incident made him realise that no one deserves to live in silence.